Love is in the air! 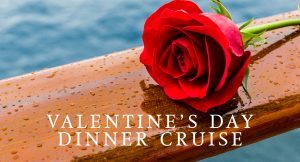 Enjoy a romantic evening on the Charleston harbor with your Valentine. Dine, dance and share the beautiful views aboard the Spirit of Carolina. We offer a 4 course dinner, made to order, on a 2 and half hour cruise of the moonlit harbor. A limited number of private tables for two are available. Make your reservations early, for the most enchanting Valentine’s Day. *Pricing for this date will be: $80 per person or $160 per couple and will include the regular menu, Chef’s dessert tax & gratuity. Private table for two and all other packages will be available at regular additional rates. All rates & availability are subject to change without notice. No refund for cancellations within 24 hours of the cruise date.